Two national strategies that can impact on our work, and the Association is very supportive of, are the National Housing Federation’s (NHF), Together with Tenants and the Rural Services Network’s (RSN), Time for a Rural Strategy. Are tenants and residents listened to when things go wrong with their home or the service they receive? Do they have the chance to influence decisions that are made about their home or the services they receive? What can they do if they don’t think their landlord is taking their concerns seriously? The NHF has been working with tenants and tenant representative groups across the country to help understand what practical change might be needed. 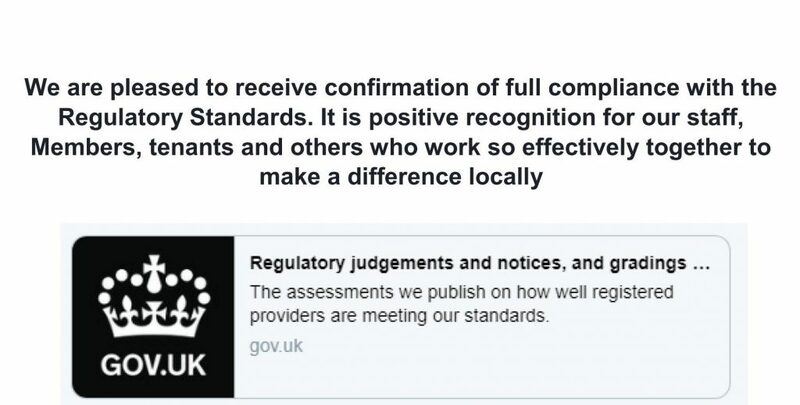 It is anticipated that a new charter providing greater clarity to what tenants and residents should expect from their landlord will result. A national Tenant’s Advisory Panel will help to steer this work and we have provided information already to our involved tenants and residents about how, if they are interested, they can apply for a place on the Panel. We like to think, based on the regular feedback we engage in, that more often than not we get our relationship about right however, we don’t get it right all of the time and that means we can still improve. We will look to follow the NHF’s developing plan with interest and implement any practical good practice changes that are recommended to benefit tenants and residents. The Time for a Rural Strategy call is based around the problem that rural communities are not a focus of Government decision making and are frequently overlooked in a policy environment dominated by urban thinking and urban policy concerns. As a result, areas such as Eden and Cumbria can miss out or experience unintended consequences from policies, which are poorly thought through from a rural perspective. The RSN are calling for action that raises rural opportunities and challenges up the political agenda. There are many strands to this but from a housing perspective the RSN claim that for every eight rural homes sold under Right to Buy, only one replacement home was built severely depleting the stock of affordable and social rented homes. A way forward would see planning policy require affordable homes on all small sites and grant programmes that were specifically designed around this. There is a growing demand for affordable homes and we must keep pace with this. The Sim Court Knit and Natter Group has been very productive in the last twelve months, raising money for resident outings and creating blankets to donate to the Jigsaw charity shop in Penrith. 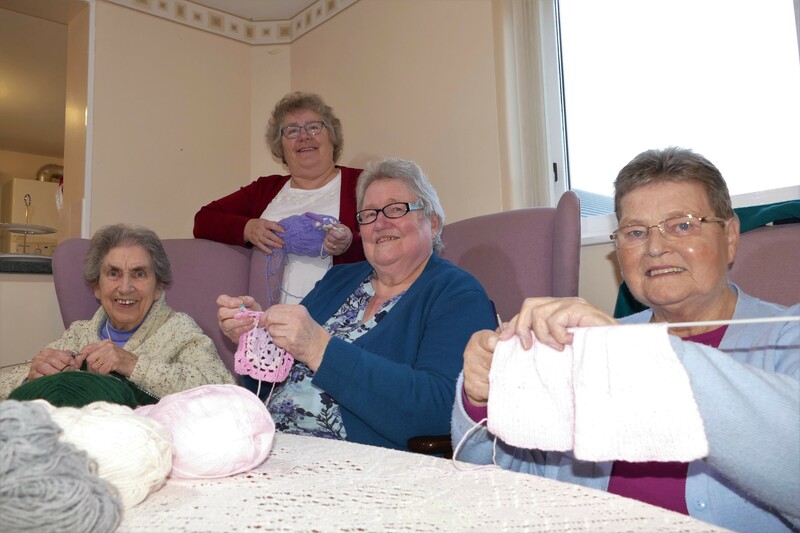 Every Monday afternoon, the Knit and Natter group get together at Eden Housing Association’s Sim Court Assisted Living Scheme, for coffee, cake and a good chat. Putting their time to good use, they bring along their knitting needles, crochet hooks and bags of wool, creating a haul of hats, gloves, scarfs and blankets to attract donations. The community group, which is made up of Sim Court tenants and local residents, has been running for many years, encouraging people to get together and raising funds to support activities at the scheme. Regular participants currently include Edna Shadwick, Hazel Boyes, Eileen Soulsby and Pat Sewell, often joined by former avid knitter Louie Dent. John Clasper, Chief Executive of Eden Housing Association said “I’d like to say a big thank you to the group who knitted some amazing hats and gloves which they sold at the Christmas Fair and also offered to our staff. These ladies are very talented and with bobble hats being so popular, there was no shortage of takers at EHA. In the last twelve months, the clickety clack of needles also benefitted Jigsaw – Cumbria’s Children’s Hospice which was the group’s nominated charity. They knitted and crocheted blankets donating them to Jigsaw at Christmas. 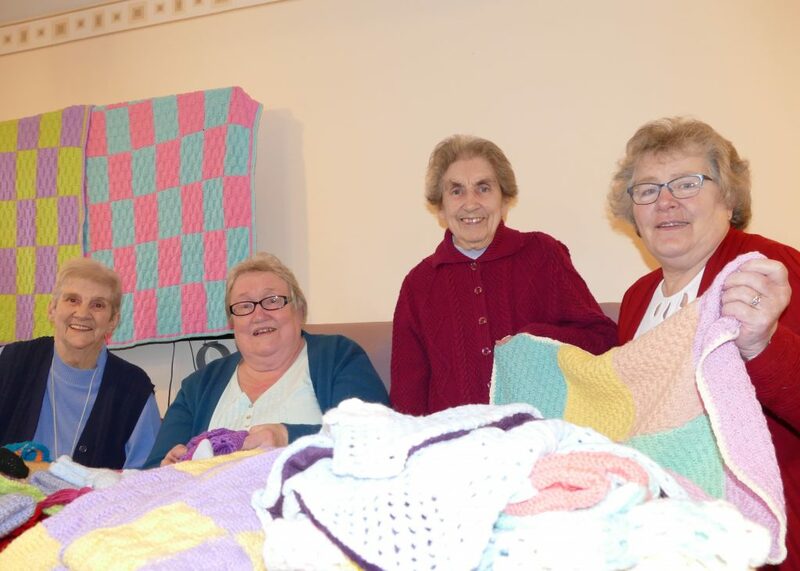 A total of 18 blankets were knitted – along with some extra hats and children’s clothing which were collected by a volunteer from the Jigsaw shop in Penrith. Loneliness can have a real impact on peoples’ lives especially when people get older. According to Age UK over 2 million people over the age of 75 live alone, so getting involved with local groups and activities can make a real difference. Using knowledge and experience gained over a lifetime to give something back to the community means you get a lot back in return – something this group of natty knitters know only too well. Jigsaw is the children’s hospice for Cumbria. From Workington to Appleby, Barrow-in-Furness to Carlisle, Jigsaw provides unique care and support to children and young adults with life limiting illnesses. EHA’S RESIDENT INVOLVEMENT GROUP TURNS 21! Eden Community Homes and Organisations (ECHO) is the united voice of tenants, residents and other customers of EHA. Membership is open to all tenants and residents living in EHA properties, and to those living close by. A full meeting of ECHO members is held six times a year, and a number of sub-groups also meet regularly. Would you like to get involved? 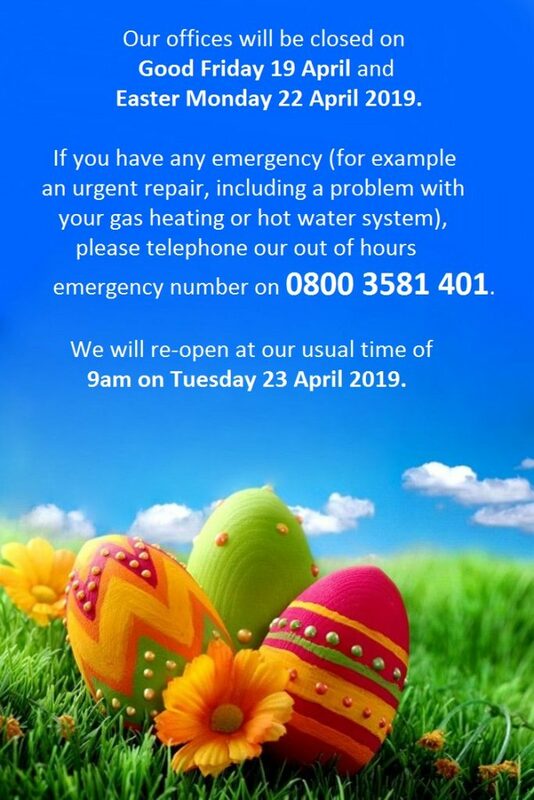 For more information call 01768 861400. 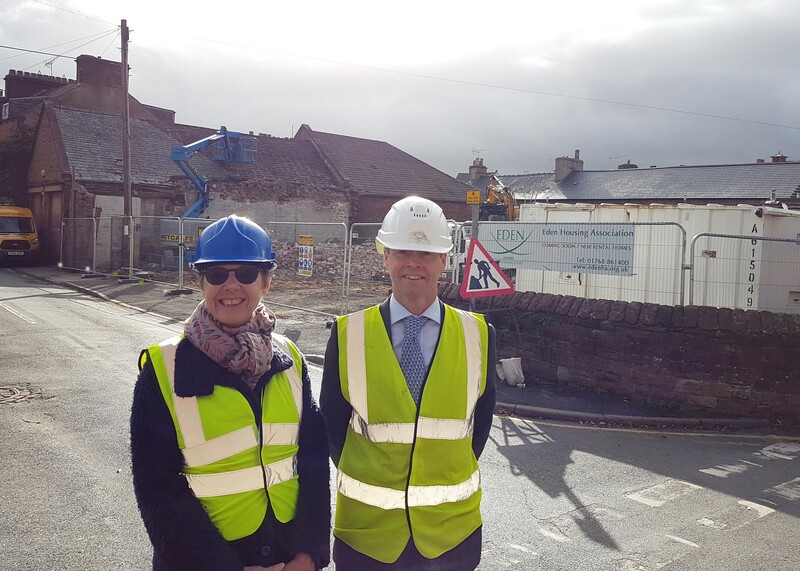 Following its successful new rented bungalows developments on Pategill and Scaws estates in Penrith earlier this year, Eden Housing Association (EHA) is continuing to build affordable homes for rent in the town. Making the most of small development opportunities, their newest development is right in the heart of Penrith. Work has commenced to create seven new homes on a brownfield site at William Street. It will be developed to create 4 two-bed houses and 3 one-bedroom flats – all for affordable rent. The site was previously a commercial garage with private garages attached for local residents. Demolition and clearance works have been completed, making way for construction work to start in the Spring. EHA is currently tendering for the building work, anticipating the homes to be ready by Christmas 2019. Rebecca Field, Development Manager at EHA, said “This is a town centre development and we are very conscious that we are developing new homes in the heart of a residential area. 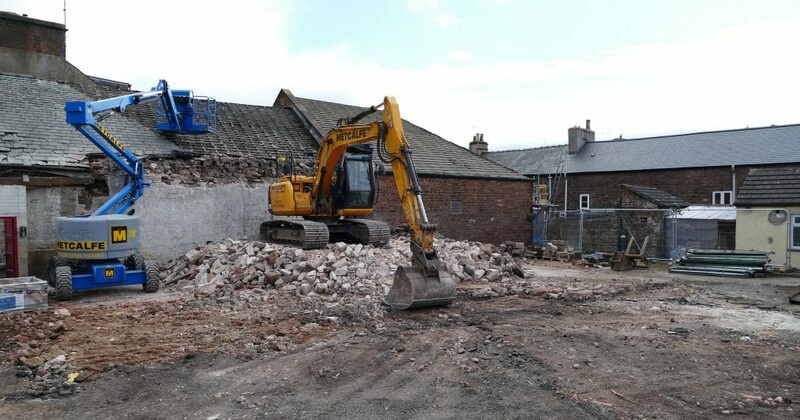 Keeping local residents informed is very important and Metcalfe’s, our demolition contractors, worked with those immediately impacted, to ensure they had the access they needed with minimum disturbance. The Association is also finalising a development of seven homes in Threlkeld. The mix of one, two and three bedroomed homes are due to be completed and handed over to tenants in January 2019. 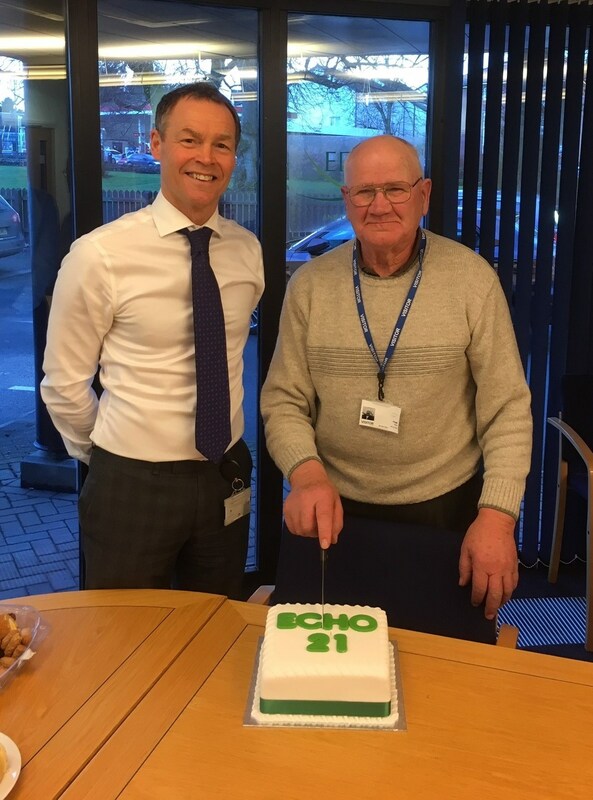 Henry Barker, Chair of Eden Housing Association (EHA) has retired as Chair of the Association under its 9 year Rule, at its recent Annual General Meeting. Henry chaired the EHA Board from 2011 and has helped steer the organisation through both memorable and challenging times. 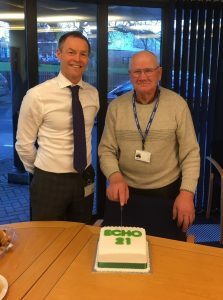 His personal highlights included overseeing the development of two Extra Care housing schemes – the first was the flagship scheme at Heysham Gardens in Carlisle in 2012, followed by the redevelopment of Mill Gardens scheme in Kirkby Stephen in 2015. Challenges have been overcome, including finding ways to contend with the Government’s imposed rent reduction policy which had significant income implications for all housing associations. Under skilful leadership from the Board, EHA has risen to the challenge, become a leaner, more efficient but still highly effective organisation that is proud of retaining its local service provision. In his closing remarks at the AGM, Henry said “The reason I have been able to do this job is because of the varied skills and commitment from all Board Members. “Our Board Members all have their own individual strengths and I urge them all to remember that. It is nothing to do with the size of the organisation it is about the skills and contributions you make that help Eden succeed and I thank you all for your support over the years. “In particular, I would like to thank Margery Manfield-Cooke for supporting me as Vice Chair and being so good at keeping spirits high. We can never know what’s around the corner, but EHA is certainly better placed to cope with whatever comes our way. Taking over as Chair is Beth Furneaux who joined the Board in September 2017 bringing with her extensive experience serving as a former County Councillor across Cumbria, leading on housing and Adult Social Care. Margery Manfield-Cooke remains as Vice-Chair, a role she has held since 2015. Margery has many years of past senior level experience with a national registered provider; with a real depth of knowledge in supported housing provision, HR and strategic management. Two new Members with strong financial backgrounds joined the Board at the AGM. Danny Roper is a local Chartered Accountant with a local firm of Accountants, specialising in Business Services and Corporate Tax. Also joining the Board is Amyn Fazal who has recently retired from his role as Chief Executive of Penrith Building Society. John Clasper concluded by saying “We are pleased to have Beth as our new Chair, who brings lots of relevant experience and insight and also to welcome our two new Board Members who not only compliment our existing skills, but they bring additional financial expertise to the team. 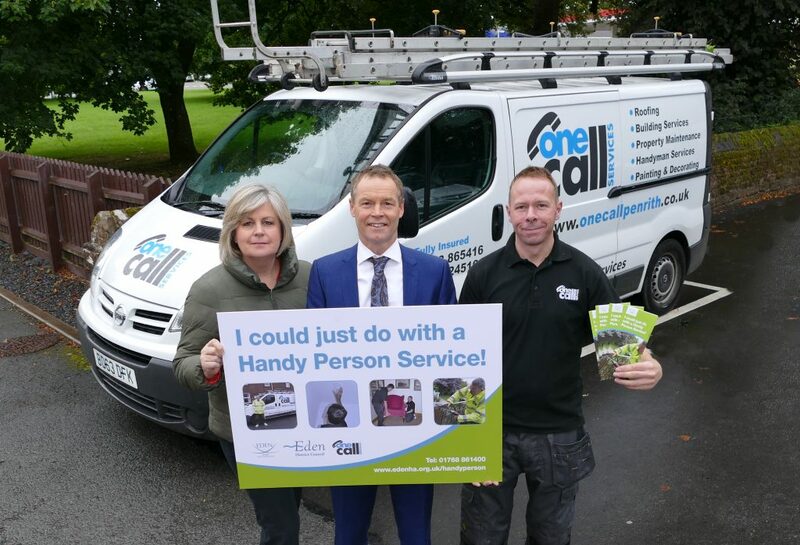 Eden Housing Association and Eden District Council are working together to spread the word about a Handy Person Service in Eden. The service, which has been running for six years, has now widened its scope to support more Eden residents. The Handy Person Service has been run by Eden Housing Association, with funding support from Eden District Council. It was originally launched for the over 55’s, but the service now has a more flexible, eligibility criteria which means more people can ask for work to be done. 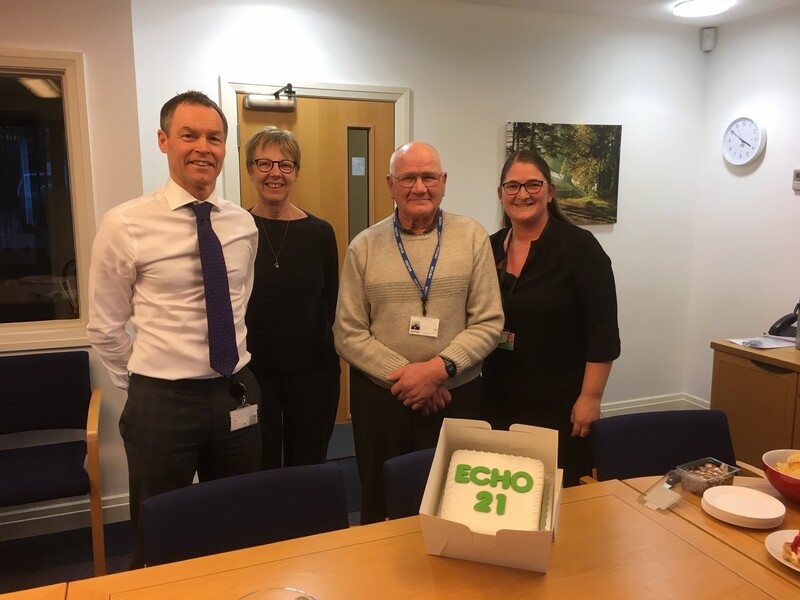 John Clasper, Chief Executive of Eden Housing Association said “We have been working with One Call Services, Penrith for six years and have had great feedback. We’ve also received funding from EDC to help us keep the cost as low as possible for customers. And we’ve engaged with home owners as well as those renting properties so we know it’s a model that is working well. By opening the service up to a wider audience, we think it will go from strength to strength. The service is now available to people over 55, those receiving qualifying benefits or living with a disability, long-term ill health or life limiting illnesses. It is also available for people being discharged from hospital or households receiving support from EDC’s Housing Options Team. Referrals will be considered from staff at local registered housing providers and from other statutory or third sector support providers. Eden District Council’s Deputy Leader and Housing and Health Portfolio Holder, Councillor Lesley Grisedale, said “We have been able to subsidise this service for the past six years. When you have a collaboration that has been proved to work well and makes a difference, it’s important to keep it going and to make sure people know they can take advantage of what’s on offer. Eden Housing Association and Castles & Coasts Housing Association are jointly procuring their Responsive Repairs and Void Maintenance Contracts. As both Associations’ contracts were due to expire at the same time, and have housing stock in the same areas, it made sense to work with Cumbria Housing Partners to jointly procure. The successful contractors will provide responsive maintenance services and void repair services within the North West of England. The work will be within two geographical lots: Carlisle and Eden and Allerdale, Copeland, South Lakeland, Barrow and Lancaster.